There are many things to do and see in St. Augustine but perhaps the most thrilling activity is a visit to the swim with dolphins program. Here is general dolphin information in St Augustine for you. No matter if you’re a child or a child at heart, you’ll find a dolphin swim program in St Augustine that makes you remember that magic is real. Put your snorkel mask on and get in the water for a memorable experience. 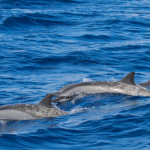 You’ll have the opportunity to swim with the dolphins in shallow water, and also out in deeper water where you can see these breathtaking animals twirling below you. For those of you with an artistic side, you’ll no doubt be delighted with the Dolphin Designs program. You’ll be able to choose up to 3 colors for the dolphins to paint on a canvas which you’ll hold over the water. Talk about fine art! Once your painting is finished, you’ll have the opportunity to interact with the dolphins from the pool deck. Maybe you’ll want to feed the dolphins? Well you can in the touch and feed program, an exhilarating experience the whole family will enjoy. Admit it, you’ve thought that training dolphins must be one of the coolest jobs in the world. Now is your chance to find out as you spend the day assisting Marineland’s trainers. You’ll spend the day preparing meals, feeding the dolphins, and taking part in the many wonderful behavioral programs at the park. At the end of the day you’ll be given a CD of photos from your day on the job, not that you’ll need photos to remind you of the amazing time you had. Happy Birthday to YOU & Gift Certificates! Is your child celebrating a birthday soon? Why not give them a day they’ll remember for a long, long time. 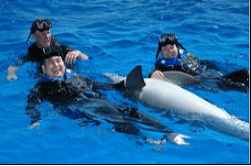 With its gorgeous ocean views and playful dolphins always looking to make new friends, Marineland offers a birthday program complete with dolphin interactions, educational programs and a photo keepsake. If you’re headed to St. Augustine, Florida and looking for an adventure of a lifetime, you’ll want to spend the day (or several) at the St Augustine / Daytona Beach Swim with Dolphins program. Gift Certificates for St Augustine need to be done by the phone. Professional photographers are taking photos during your dolphin program. You can purchase them after your program. No cameras are allowed in the water with the dolphin. If you do have an observer, they can take photos or video while you are in your program. How many dolphins does the Dolphin Facility have? The Dolphin Facility houses 14 Atlantic bottlenose dolphins, 8 females and 6 males. Am I able to hold onto a dolphin’s dorsal fin and be pulled around in the water as part of my Immersion program? No. We want to ensure our programs are fun for the dolphins and guests and that guests spend a maximum amount of time with the animals. The interactions in each program are tailored to meet those goals. Dorsal fin tows require time to ensure each guest is trained to do them properly, and that means other guests will spend time waiting rather than enjoying the animals they have come here to experience. The Dolphin Facility no longer does formal dolphin shows, but you can still watch our dolphins play or interact with them in any one of our many wonderful programs. What can I do as a general admission guest? General admission guests are able to view the dolphins through 6 x 10 foot acrylic windows as they swim, play and interact with guests in programs alongside the pristine Atlantic coastline. Does the Dolphin Facility have a restaurant on-site? No. We no longer have a restaurant on-site. 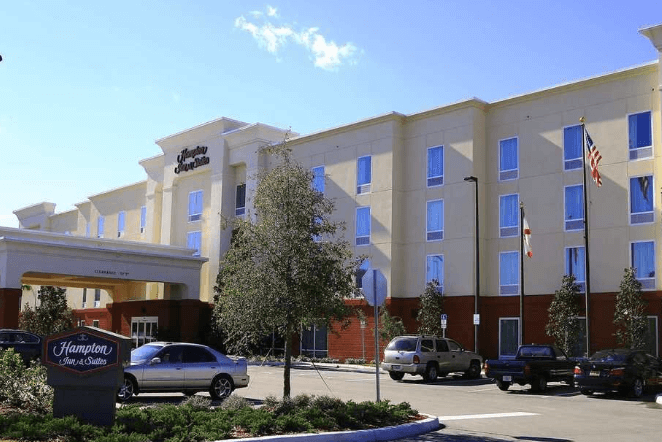 We recommend that you bring your own food or go to St. Augustine or Daytona Beach to grab a bite to eat. Is the Dolphin Facility all outdoors? What might the weather to be like? 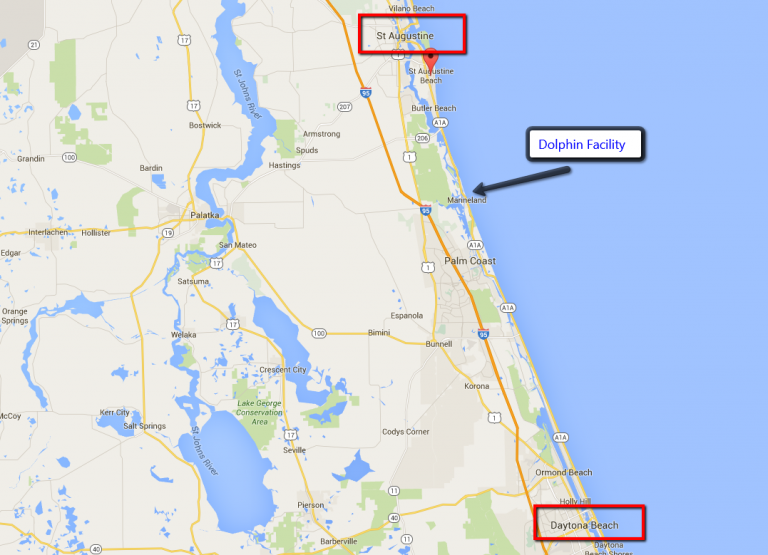 Yes, the Dolphin Facility is entirely outdoors and is located directly on the Florida coastline. When planning your visit, please prepare as you would to be outdoors on the beach. In mid-summer, temperatures are in the 80s and 90s, and the air is humid. Daily afternoon showers may occur, and brief afternoon thunderstorms are not uncommon. Because of this, your program may be delayed. During the winter months, daytime temperatures can range from 40 to 70 degrees, with winds off the water. Whether you are just visiting or participating in a partial or full-day program, please remember to eat normally and to remain well hydrated prior to arrival and throughout your visit. Sunscreen, protective hats and clothing and sunglasses are recommended. Is the Dolphin Facility wheelchair accessible? Yes, our facility is wheelchair accessible, and we can also accommodate other types of special needs. Do the programs still go on when it rains? The Dolphin Facility Dolphin Adventure runs programs rain or shine. If it starts to lightning and we think it would be dangerous for guests to enter the water, we will postpone until later in the day. The only time we cancel programs is if there is a hurricane. Yes, our pools are heated. Are the interactive programs in the ocean? No. The programs are held in our 1.3 million gallon pool facility. Where do I check-in for the interactive programs? You should check-in at the Gift Shop, which is at the entrance to the Dolphin Facility. You must present the Dolphin Ticket we sent to you by email or text. Is there anything else to do before or after the dolphin program? Yes, you have FREE access to the beach and the Atlantic ocean. Bring your own chair, towels, drinks and food and enjoy the Atlantic ocean. How do I get to the Dolphin Facility? After you have made your reservation, you will get complete ticket and directions sent to you via email or text. Can other family members take pictures of me while I’m in my program? Yes, family members are allowed to stand/sit in the general admission area to take pictures and watch your interaction. Is there one part of the day when the dolphins will interact more? No. Our dolphins participate in programs at will and continue to play throughout the day. Do I get to touch the dolphins when doing an interactive program? Yes, you’ll have plenty of opportunity to touch the dolphins and do a variety of other interactions as well! Do I get to touch the dolphins as a general admission guest? No. You will be able to watch the interactive programs, but not participate. What do I need to bring for the interactive programs? Please be sure to bring a swimsuit and towel for programs in the water. For dock-side programs, please wear something that you would be comfortable being splashed in. Are wet suits & life jackets available? Yes, wetsuits and life jackets are available at no additional charge.